D-FW’s overall appetite for NCAA hoops had been the equivalent of Kentucky’s missed free throws until Monday’s grand finale finally slam-dunked everything in sight. UConn’s 60-54 win at Jerry’s Palace over the favored Wildcats put CBS atop the D-FW Nielsen ratings against formidable competition from the second halves of NBC’s The Voice and ABC’s Dancing with the Stars. The championship game averaged 582,307 viewers, with 276,820 in the advertiser-prized 18-to-49 motherlode. The Voice had respective totals of 312,457 and 159,578 viewers while Dancing drew 326,660 viewers with 74,904 in the 18-to-49 demographic. Both talent competitions aired from 7 to 9 p.m.
Monday’s 9 p.m. also-rans were led by ABC’s repeat of Castle in total viewers (191,735) and Fox4’s 9 p.m. newscast among 18-to-49-year-olds (68,391). 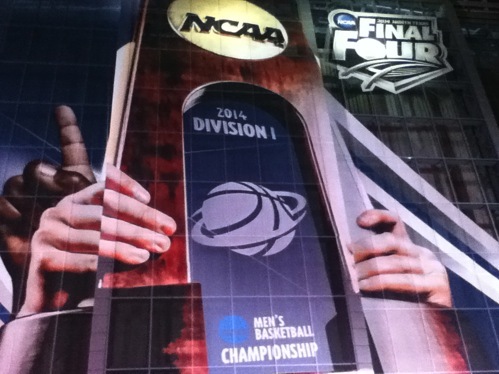 The NCAA championship had built to 617,813 total viewers from 9 to 10 p.m., with 296,360 of them 18-to-49-year-olds. During Monday’s daytime hours, the Duck Commander NASCAR race at Texas Motor Speedway averaged 127,823 total viewers on Fox after being washed out by Sunday’s rains. Over on Fox Sports Southwest, the Texas Rangers’ nighttime loss at Boston had 92,317 total viewers. Here are Monday’s local news derby results, with CBS11’s 10 p.m. edition preempted by basketball and the CBS post-game show. WFAA8 topped the down-sized three-way race in total viewers, but NBC5 nipped Fox4 for the most 25-to-54-year-olds (main advertiser target audience for news programming) while WFAA8 uncommonly fell to third. Fox4 cruised to another pair of 6 a.m. wins and added a 5 p.m. first in the 25-to-54 demographic. NBC5 had the most total viewers at both 5 and 6 p.m. while tying Fox4 at 6 p.m. for the 25-to-54 gold.